The latest diorama by Gary the Procrastinator shows a not unusual day in 1943 at Randolph Field. Back in 1943, the US Military had a need for large numbers of new pilots to fight in World War II. 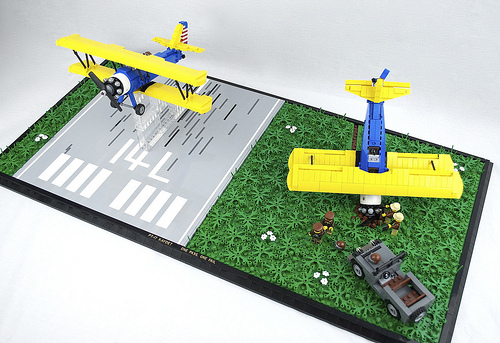 Their standard training aircraft was the Boeing Stearman 75 Kaydet, often known simply as the Stearman. Like many aircraft of its era it was a so-called tail dragger, with an undercarriage that consisted of two main wheels and a tail wheel. Taking off and landing in such an aircraft could be tricky, in particular in crosswinds. In the diorama, one trainee pilot gets it right. The other, however, has veered off the runway, the main wheels have dug into the grass and the aircraft has nosed over. The aircraft models are beautifully built in the colours typical for these trainers and, while the landscaping is a little more straightforward than on Gary’s march to Gettysburg diorama, the tyre marks on the runway and through the grass are a nice touch.